That’s the last thing you hear before the clock starts to tick. You only have a small handful of minutes to prepare (up to) three dishes to be tasted and judged by official members of the Battle Chef Brigade. These competitions seek out the fiercest hunters and most sensational of cooks, ensuring every recruit mastered their personal culinary craft. Brigadiers need brains in the kitchen—that much is certain—but you must collect your own ingredients and, depending on the match's main theme ingredient, that could require some serious chops. You, however, are not alone. You’re competing against a fellow chef, and they left the kitchen to harvest ingredients like thirty seconds ago. Competition is fierce. 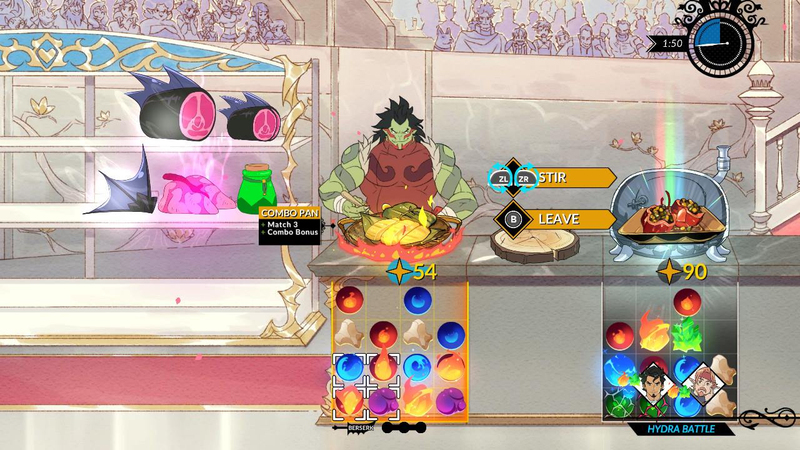 Battle Chef Brigade demands an array of skills from you, the player, and offers a ton of charm and character in return. Attentive creators and a chummy community together become mutually beneficial; however, in this case, it could even help manifest the game's fictional aromas in your own, very real kitchen. The story begins by giving you control of Mina Han, a female human rogue from the Windy Village who travels to Brigade Town to compete for an official spot in the Battle Chef Brigade. Mina’s nimble in her harvesting, making short work of her soon-to-be ingredients while twirling effortlessly between cooking and hunting. Thrash, a male orc berserker on a similar quest as Mina, prepares cuisines from an entirely different cultural background having grown up in the West Ocean Tribe. His Berserk ability allows him to actively consume ingredients out in the wild, tossing Thrash into the void and blacking out his entire body to buff his speed and strength. Don’t be fooled: despite his power, Thrash is more of a family “man” than a barbaric orc. Ziggy’s always been around in the game’s story. Nowadays, he’s the newest playable cast member with the release of Battle Chef Brigade Deluxe. He’s a suave, undead necromancer who summons demonic aid to do (most of) his fighting for him; otherwise, his hands are usually in his pockets. Not much else is known about him—other than his affinity for cheeseburgers—but his comical attitude gushes out onto the battlefield as meandering zombies and mischievous little ingredient-stabbing demons run amok. Ziggy’s playable-side adds a wholly new, fitting flavor to his character, revealing just how much of Mina and Thrash’s attitude is felt through gameplay. After you survive the potentially fatal process of “collecting ingredients,” your selected Cookware will determine the tactics necessary to produce a good dish. You have three types of taste “gems” to work with: fire, water, and earth. Different combinations sculpt the overall flavor profile of each dish, and you may have up to three different palates to satisfy within the given time limit. Cooking items like expertise books can passively improve food quality if certain conditions are met. You could become a Noxious cook and intentionally cook with more poison and bone than other chefs. You can operate as a vegetarian or carnivore, and even gain benefits for exploring and utilizing most of the region’s fauna and flora in your recipes. Some pots slowly clone taste gems; others improve existing flavors over time. The Hearty Oven slowly repairs fragile taste gems, but sacrificing it could make enough room for Thrash’s Orcish Fire Oven that quickly promotes fire taste gems...and nothing else. While many characters aren't exactly controllable, they manifest their personalities in other ways. Quetzal’s Sapphire Tea is an equippable item that gives you extra mana to use for magic attacks. Kirin’s Winged Boots grant the player a double jump. Weiz’s Autographed Headshot prevents a knockout once in a match, imperative for those too careless around dangerous creatures like the Hydra or Dragon. In the digital kitchen, Wart’s Spatula protects fragile taste gems for one extra move. Leonid’s Rainbow Droplet starts the match with three rainbow ingredients in your pantry, fit for any dish. Thrash and Ziggy even have their own condiments: Thrash’s Hot Sauce and Ziggy’s Relish give the player two free red and green sauces (respectively) to help adjust a recipe’s flavor profile. You can only equip three combat, cooking, and cookware items to use in a match (nine total), so the combinations contained within the game’s culinary armory becomes quite impressive. Putting together a good loadout is as much a recipe as the very dishes you submit to the judges, and daily cook-off challenges provide a continual source of new problems to solve with pre-determined set-ups. The competition for a spot atop the leaderboards may be imposing, but that doesn’t prevent the community from helping each other improve. 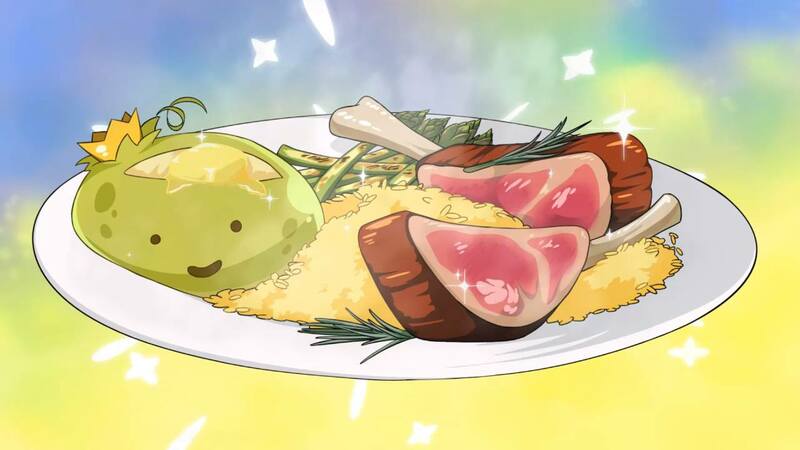 Battle Chef Brigade's Discord server is full of cooking strategies shared between chefs, with reasons for different ingredients and various ways to prepare them. They're even helping developer Trinket Studios. “The community has been extremely useful for tuning the balance of the arenas, especially in Daily Cook-Offs,” said Tom Eastman, President of Trinket. When asked about any unexpected adjustments they had to make, he offered some more insight into their process. 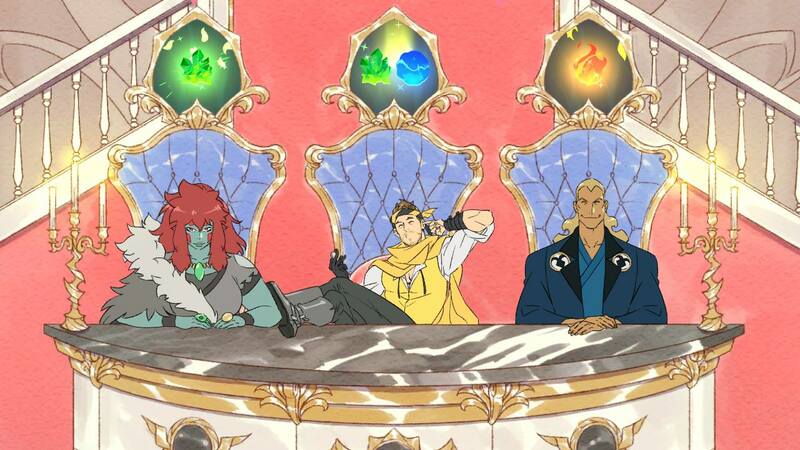 To celebrate the release of Battle Chef Brigade Deluxe, Tom Eastman, Ben Perez (programmer), and Eric Huang (artist) assumed the role of real-world Brigade chairmen. The trio hosted a week-long Battle Buffet event with publisher Adult Swim, complete with in-game competitions and community celebrations via Discord. “The world of Battle Chef has so many areas to explore, both large and small,” Eastman said. “It's been hard, as a three-person team, to dig into all of them!" Throughout the event, a fan art contest replaced forks and knives with brushes and pens, offering another avenue of community-building outside of the week’s speedrunning contests and daily competitions. Recipes for Tombstone Tacos and Ziggy’s Chilly Cheesesteaks stood alongside a raffle for an official Battle Chef Brigade Easy Bake Oven. Links to community members streaming the game were posted and promoted around the digital town, often teaching viewers cooking tips not unlike an episode of Good Eats. WorkingChef and DomesticDan both streamed the game to preheat the Battle Buffet’s “Stream Saturday," followed by Elegy’s live stream and a Labor Day celebration packed with photos of real, good-looking food—some that even rival the digital succulence of Battle Chef Brigade’s in-game dishes. 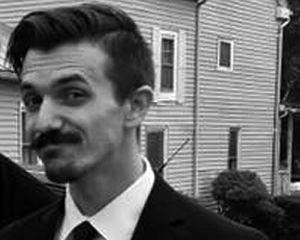 "We're working now on the art book that was originally a Kickstarter reward - it might be neat to slip some recipes into that," said Eastman. "In the mean time, there are some really talented fans who made recipes included over at Pixelated Provisions." 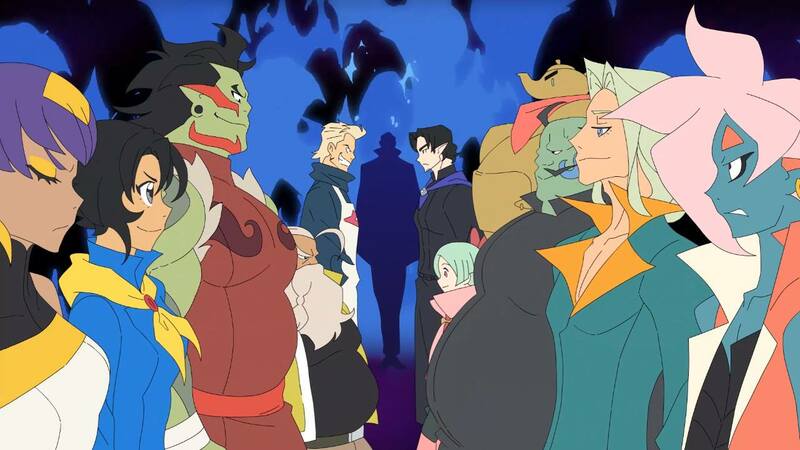 Battle Chef Brigade’s community feels like a real life Brigade Town. Well-illustrated. Welcoming. Alive. Not clamorous; collective. Whether it’s getting in-game cooking advice from others in the Practice Kitchen channel or supporting a streamer who linked their Twitch in the Sausage Links channel, fellow chefs are around to help you in the kitchen -- both in-game and in real life. 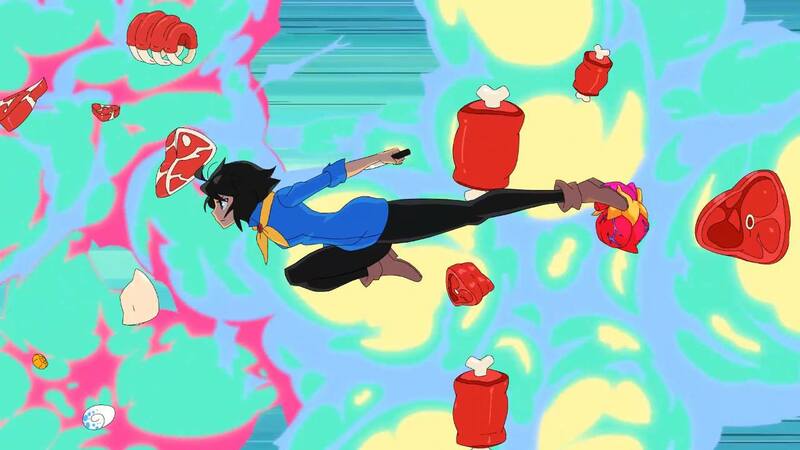 The culinary and cultural backgrounds of in-game characters injects Battle Chef Brigade with a tasteful diversity that echoes through the digital halls of its own community.